I wanted to go back in mid to late May, as this is before it gets too busy. 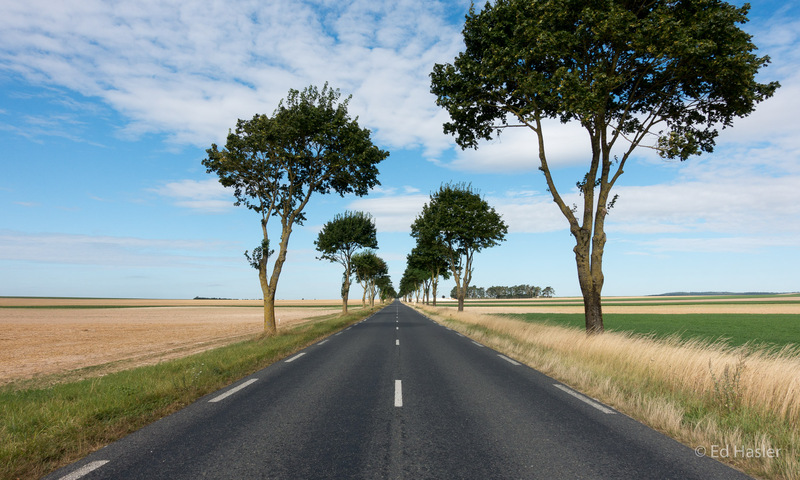 Also the weather can get too warm during the summer, so May is an ideal time to visit. There other reason I chose May is that it is usually a good time for the poppies to be out. To me, Tuscany landscapes are green rolling hills, Cypress trees and poppies, so I really wanted to be there in poppy season. 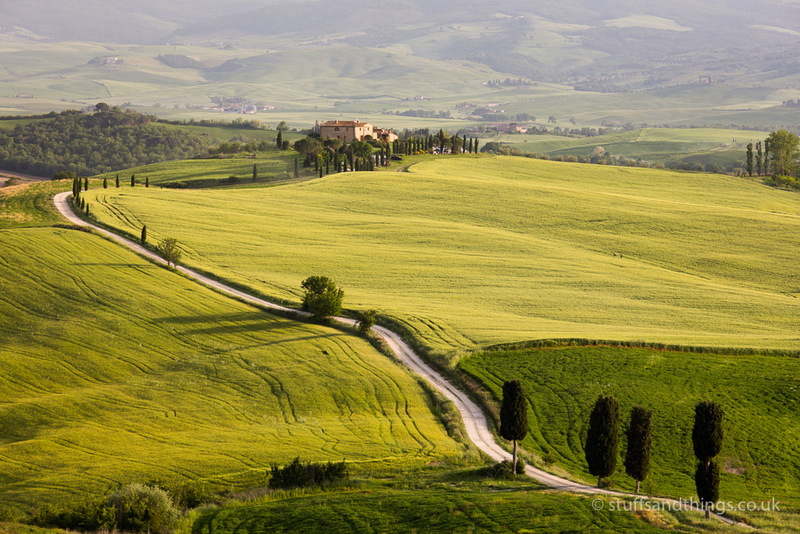 As I was only going for a couple of days, I wanted to make the most of my time in Tuscany. 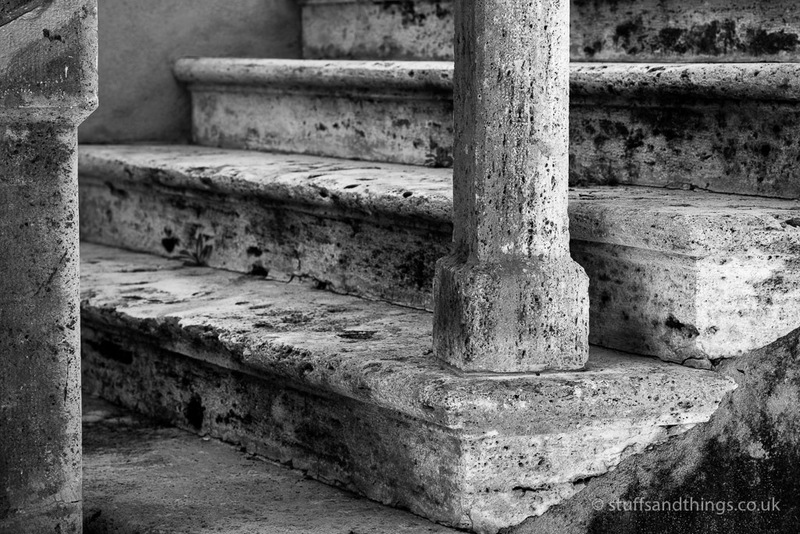 As I’d been to the area before, I had some ideas already of what photos I wanted, but I also wanted to seek out some new locations. 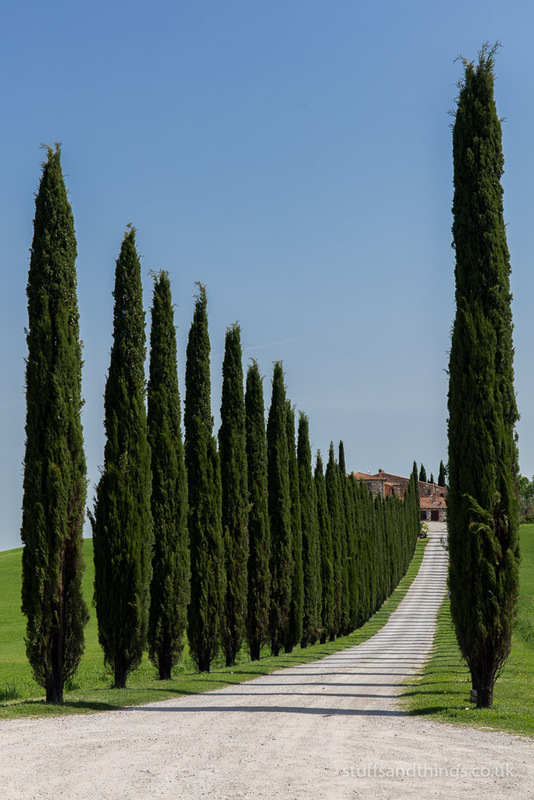 The great thing about Google is that it is is so easy to find great images from Tuscany, but sometimes it takes a bit of work to determine exactly where they were taken. After quite a few hours of looking at Google Maps, I eventually came up with a list of locations. I also used a website called SunCalc to work out the best times to take photos based on the sun location. With this, I soon came up with an itinerary for the couple of days I’d be there. As it is a long drive from England, I decided to fly this time, and booked flights to Pisa from Luton. My flights were with Easyjet, and I had booked Speedy Boarding to ensure I could beat the rush to board. I didn’t however realise until after I’d checked in my suitcase that Speedy Boarding also entitles you to their Fast Bag Drop service. Had I used this, it would have saved me 10-15 minutes queueing up, but at least I know for next time! I had also pre-booked a hire car from Avis for my stay there, as I wanted to be able to explore the local area. The flight was uneventful, and about 2 1/2 hours later we were preparing to land at Pisa airport. Not long after flying past the Leaning Tower, we touched down at about 4.30 pm. Soon afterwards, I collected my hire car from Avis, and was on the road to Tuscany. 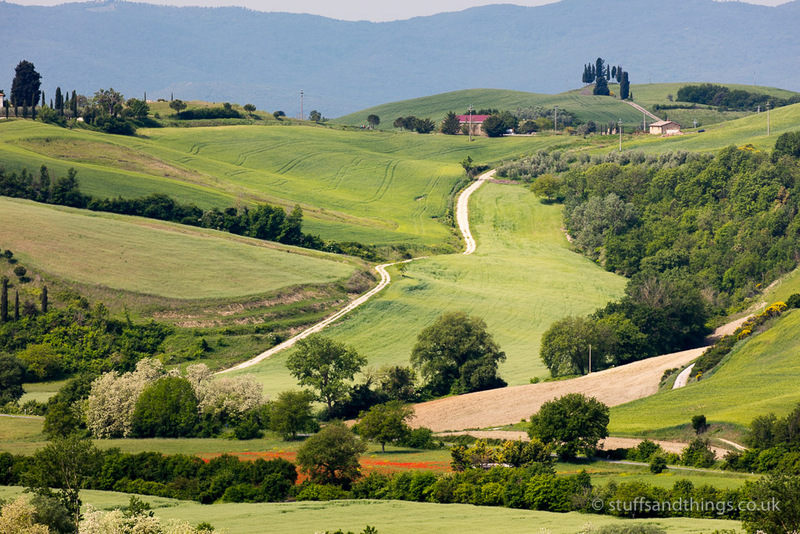 I was staying at a small town called San Quirico D’Orcia, which is about 30 miles S/E from Sienna. 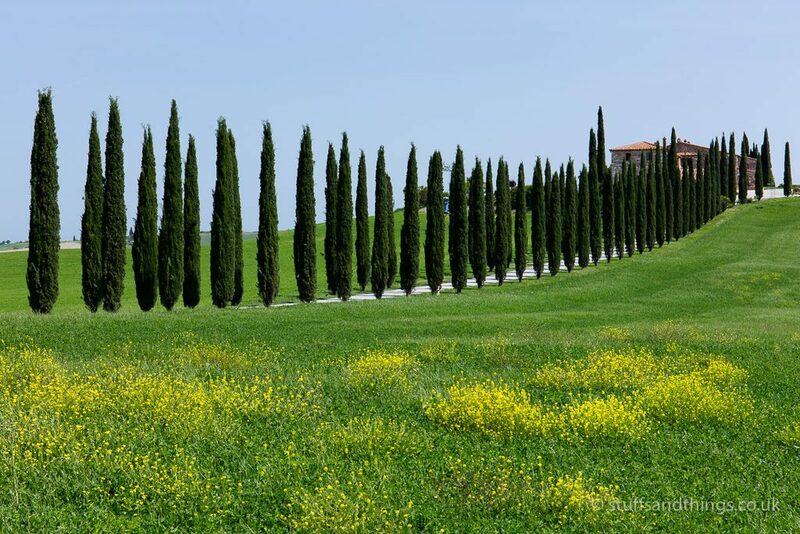 I’ve stayed here before a few times, and it is a great location – right in the middle of the Val d’Orcia. I had booked a room at the Casanova Wellness Centre hotel, which is situated just outside the town. It’s a nice hotel, and perfectly situated just a few minutes walk from one of my favourite sunrise locations. 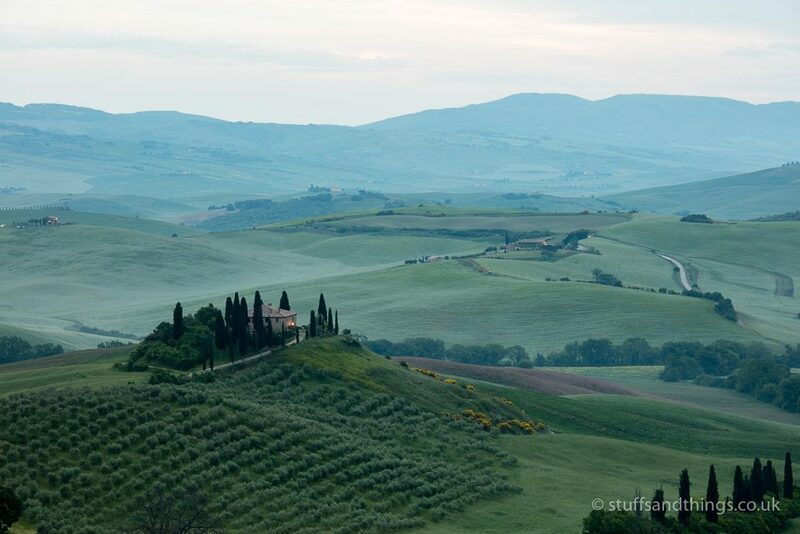 It also overlooks one of the most beautiful landscapes I’ve seen – the Val d’Orcia. With this being a photography holiday, there would be no relaxing lie ins for me. My alarm was set for the far-too early time of 5am to ensure I didn’t miss the sunrise. Despite the temptations of the cosy bed, I sleepily let myself out of the hotel and wandered down the road. I’ve been to this spot before, so knew roughly where I wanted to be, and quickly set up my tripod. Unfortunately, it was quite cloudy, so the sunrise wasn’t worth photographing. This is one of the risks of photographing sunrises – you never know if that early start is going to be worth it or not. As this is a popular spot, I wasn’t surprised when a couple of other photographers arrived, and set up their cameras just a few feet away. It was good to have a bit of company while we waited in vain for something interesting to happen with the light. You can’t win them all eh! The next location on my itinerary was a small village called Lucignano d’Asso. This was about 20 a minute drive from my hotel, so after breakfast I set off in my hire car. I was keep to re-take a photo I’d taken a few years previously, but the light wasn’t quite right back then. 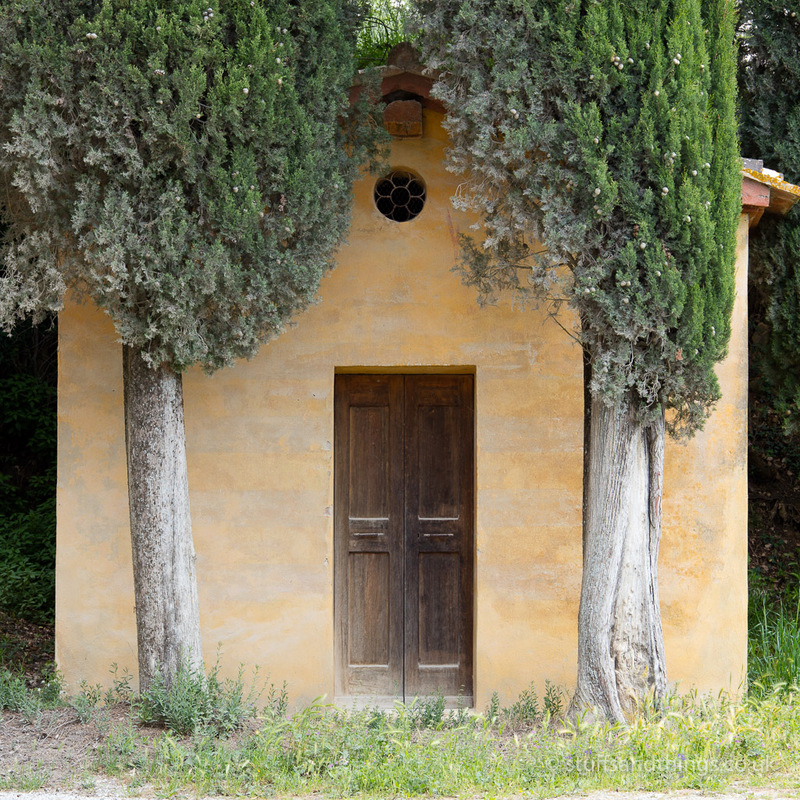 The location was a small chapel, nestling between some Cypress trees, alongside a gravel track. As I got closer to the road to Lucignano d’Asso, I glimpsed a flash of red up ahead. Soon afterwards, a glorious field of poppies came into view! I didn’t have time to stop though, as I needed to be at the chapel before the sun got too high. Not long later, I pulled up outside the small chapel, and it looked exactly as I remember it. I tried a few different compositions, and took a number of photos at various distances using different focal lengths. About 30 minutes later, I’d got a shot I was pleased with and walked back to the car. As I got closer, I noticed a lovely view in the background, so spend another 10 minutes taking a few more shots. I then spent some time wandering around the village of Lucignano d’Asso, exploring the streets. 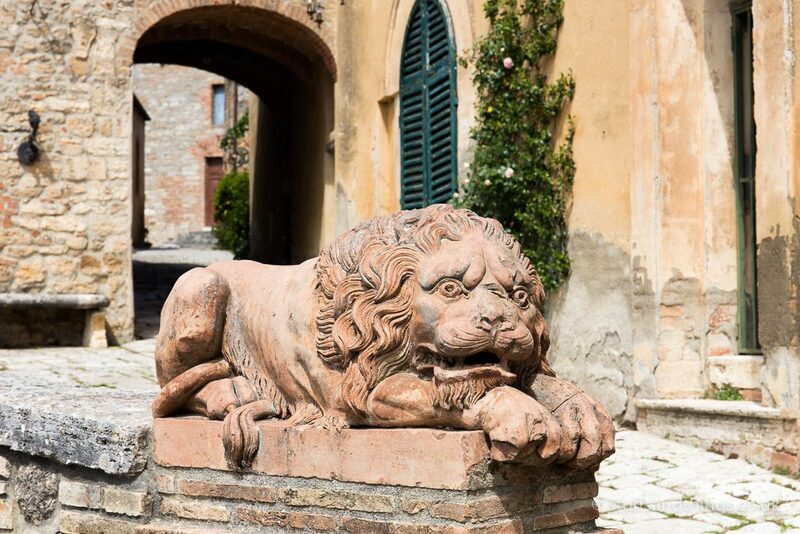 It’s a very small place, but there are some lovely details to photograph including a stone lion guarding one of the roads. I then drove back down the track, back towards the field of poppies I’d spotted earlier. I found a safe place to park the car, and wandered over to the field with my camera. 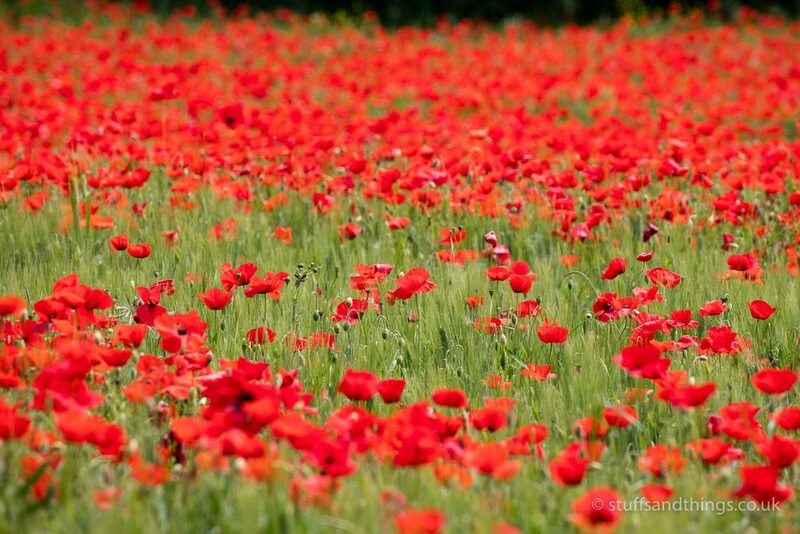 The field was absolutely full of bright red poppies, gently swaying in the breeze, begging to be photographed! It’s never guaranteed that you’ll find this many poppies in Tuscany, even in May, so I was very pleased to have found these. Unfortunately, this was the only field full of them I saw on my trip. By this point, the sun was a bit too harsh for photography so I packed the camera away until later in the afternoon. To pass the time, I then drove to Montalcino to visit one of my favourite wine shops. Sadly, I was limited by my luggage capacity, so could only buy a few bottles. I then drove east, and spent a couple of hours in Montepulciano, wandering around the pretty, narrow streets. 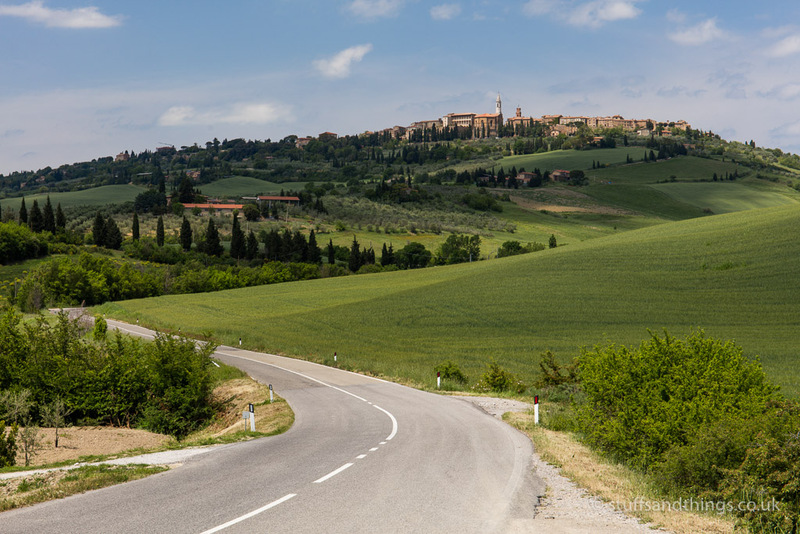 After lunch, I drove towards Pienza, then headed south for the next location on my list. There was a shot I wanted to take of the road sweeping into the distance with Pienza in the background. However, the weather wasn’t playing ball, and it was too overcast to get a decent photo. On the plus side, I did manage to find a good spot to get exactly the shot I wanted, so it was just a case of returning when the light was right. The next location on my list for the afternoon was the winding road near Monticchiello – a small medieval village. This was a bit of a wash out too, as the flat light just didn’t do anything for me. By this point, I was pretty sure the rest of the afternoon would be a waste of time too. The dull weather wasn’t giving me any confidence that the sunset would be any better. However, with landscape photography, you have to persevere and so I drove to the next location on my list. This was the villa made famous in the film Gladiator, and after a fair bit of research I had found a great place to photograph it from. I had to park the car at the top of a private road, and carry my camera backpack and tripod down this stony track. As the villa came into view, I could see some people and a van right in the middle of the shot I wanted to take. As I got closer, I noticed they were shooting an advert for a cycle manufacturer. It wasn’t really a big deal though as the light was poor, and not really worth taking any shots. However it was good to do some reconnaissance, and I knew exactly where to go the following day when hopefully the weather would be better. I lugged my camera back up the steep uphill track, and 15 minutes later was back at my car. The final location in my list for the day was a 20 minute drive north, near Asciano. My pre-trip planning using Google maps paid off, as my sat nav led me straight to the spot I wanted. Sadly though, this was wasted effort as the sunset proved to be dull and uneventful. However it was still enjoyable being out in the beautiful Tuscany countryside admiring the views over the Crete Senesi. At this point, I drove back to my hotel, and enjoyed dinner at a nearby restaurant then an early night. My final day of photography started with another early alarm call, and I was soon leaving the hotel in the pre-dawn darkness. This time I was joined by a small group of photographers, however the light was no better than the previous morning. The sky was a bit featureless for my liking, but I managed to get a couple of shots that were quite nice. Next on my list was a small winding road near La Foce I’d seen on a previous trip about 10 years ago. I’ve seen some lovely photos of this road online, but today wasn’t my day. There wasn’t much colour in the sky, and the fields surrounding the road were all green. Without the contrast of warm sunshine and different coloured fields, the shot just didn’t work for me. The same was the case at my next location, as I returned to the second twisty road near Monticiello. Again, the dull sky and lack of contrast made it impossible to get a good photo. The one important thing about landscape photography is to persevere. So undeterred, I drove back up to Pienza. I had calculated that the sun would be in the right location for a shot I’d tried the previous day. Returning to the spot I had found, I was pleased to see that finally the weather was playing ball. I managed to get a shot I was reasonably pleased with, although would like to come back again to see if I can improve it. Now that the light was good, I was optimistic about the rest of the afternoon and evening. I wanted to return to the Gladiator villa again, as this was just up the road. My schedule was quite tight however, as I also wanted to return to Asciano for sunset. My final location of the day was another one that I’d visited the previous day. This was of the Agriturismo Baccoleno, near Asciano. I parked up in the same spot as before, and waited hopefully for a good sunset. Fortunately today, my patience and perseverance paid off. As the sun dropped towards the horizon, the sky turned a lovely shade of orange and bathed the green fields in a lovely warm light. This turned out to be my final, and favourite image of my short photography trip. Getting this one shot made all the travel and work worthwhile! 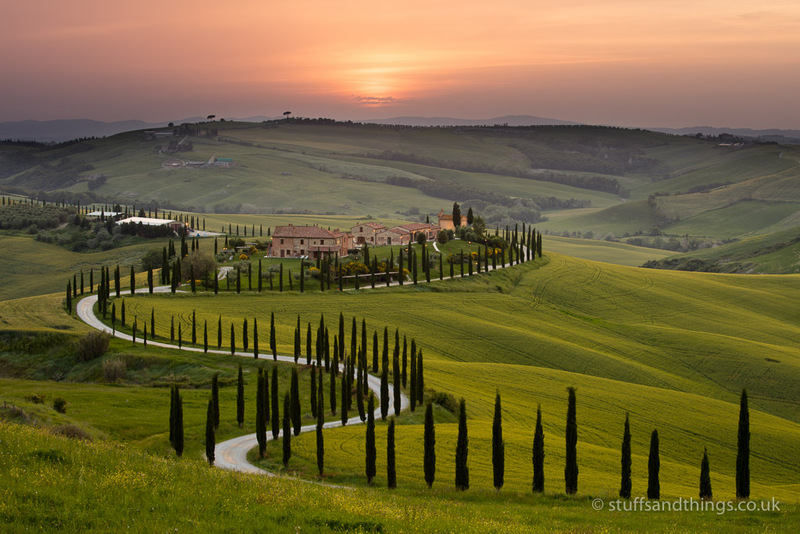 Great photos from Tuscany! I am curious, how close to Lucignano d’Asso is the little yellow chapel? I would love to see this spot. Let me know if you have a moment, thanks! Thanks for the comments! The little yellow chapel is very close – it’s on the gravel road which leads to Lucignano d’Asso from the SP14 road to the west. Here’s a link to Google maps which shows the exact location – it’s a lovely spot, and a beautiful area to visit, so I hope this helps! Thanks – it is an amazing place, and I can’t wait to return!